Building credit and maintaining your credit score is a long-term endeavor. That doesn't mean you can't make big improvements quickly. When times were tough, you did what you had to do to get by and your credit score suffered. Now you're in the market for a home, car, or other purchase and that sagging credit score is haunting you. Here are five strategies that can improve your score fast and also lay the foundation for a permanent, long-term improvement in your personal finances. Honestly, if you are past due on one or more of your credit accounts you shouldn't be focusing on your credit score. You have much more urgent considerations -- like hustling just to make ends meet. You can work on fixing your credit after your monthly cash flow becomes more stable. But if you are in a jam and need a quick boost to your credit, catching up on payments will improve your score. It seems obvious, and perhaps it is. But fundamentally this is what it's all about -- paying your obligations on time. Don't expect miracles here, but a current account is far better than a past-due account. Creditors are not legally allowed to report your account as delinquent unless you are 30 days or more past due. Use this to your advantage and keep your accounts less than 30 days behind. Ideally, keep them current enough to avoid any late fees, but when times are tough you are forced to make tough choices. If you haven't already, log in to AnnualCreditReport.com and check your credit report for any inaccuracies. Carefully review everything: payment history, outstanding balances, collections actions, credit limits, account numbers. Check it all. If anything is incorrect, file a dispute with each of the three reporting agencies: Equifax, Experian and TransUnion. The formulas these companies use to calculate your score are top secret. No one really knows exactly what causes your score to jump 20 points from one month to the next. The last thing you need is an inaccuracy hurting your score any more than is justified -- particularly when that discrepancy is the difference between qualifying for a loan or not. Even though the credit score formulas are secret, the credit agencies do provide some guidance on how they work. For example, a mortgage loan that is paid on time every month is actually a major credit score boost. And on the flip side, a maxed-out credit card is among the greatest credit score negatives outside of delinquent payments. One large driver of the credit card's impact on your credit score is its "utilization rate." The idea is that a maxed-out credit card is bad, while a credit card that is at 30% of maximum or less is better. The credit agencies see this level of use as evidence that you can use your revolving credit responsibly and with discipline. Knowing this, focus immediately on reducing the balances on your credit cards until they reach that 30% level. A maxed-out credit card is a powerful enemy to your credit score. As long as your payments are completely current, attack those credit card balances to see a quick improvement in your overall score. There are hundreds of shady credit advisers trolling the Internet with promises to reduce your debt overnight. The sad reality is that this oftentimes means negotiating a "charge off" with the creditor. If you have any intent of borrowing money for the next seven years, you should avoid a charge off like the plague. To a bank, a charge off is tangible proof that you won't repay your debts. Imagine loaning money to a friend. If that friend didn't pay you back, would you lend your money to them again? Of course not, and that's why you should work to always avoid a charge-off situation. That said, it's perfectly acceptable to negotiate. If a collection agency has been hired, you can request in writing that the agency mark the debt as "paid as agreed" if you pay the debt in full. This would remove that collection action from your record and immediately boost your score. Proceed with caution, though. This tactic only works if the debt is changed from a collection to a "paid as agreed" status. Just paying off the collection will not remove it from your report. Get it in writing, and follow up to ensure the change actually happens. This final tactic goes back to the credit utilization concept mentioned above. By paying your credit card bill twice a month, you'll only keep two weeks worth of spending on the card at a time. That means that each month your total credit card balance will be lower. 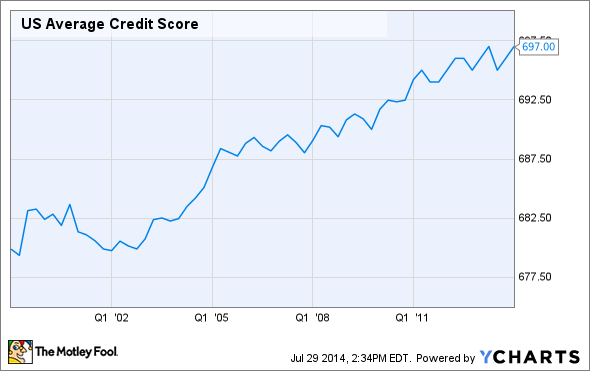 US Average Credit Score data by YCharts. It's a clever trick that can lower the appearance of your credit card balance on your credit report without any change in your actual month-to-month cash flow. If you typically spend $1,000 per month on your card, pay $500 on the 15th and $500 on the 30th. That way, the maximum on your card at any time is 50% less without any change in your budget or use. Applying these five tactics will immediately boost your credit score. But the next 30 days is only the start. By committing to paying your bills on time, working hard to reduce credit card balances, and checking your credit report every year, you can turn your credit score from a liability to an asset. Building solid credit is a key component to taking control of your personal finances.